We’d love your help. 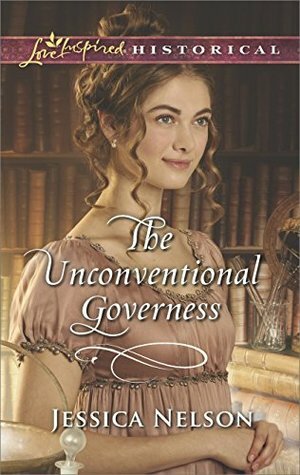 Let us know what’s wrong with this preview of The Unconventional Governess by Jessica Nelson. Henrietta Gordon has one dream: to practice medicine alongside the uncle who raised her. But when he insists she stay in London and find a husband, she must figure out a way to earn money toward her goal. Could handsome earl Dominic, Lord St. Raven, be the answer? To ask other readers questions about The Unconventional Governess, please sign up. So -- Dominic -- excuse me while I languish on my fainting couch while I type this because he is such a swoonworthy hero! A little bit brooding (with good reason) and a whole lot appealing. His heart for his niece made me a fan first because who can resist a grown man turned to putty at the hands of a precocious twelve-year-old? But their relationship is complicated and in danger -- hence the need for a governess. Henrietta might be considered an unorthodox choice, but there's no disputing the fact that she is highly intelligent...and opinionated. And not shy about speaking her mind. Sparks fly and the air fairly crackles with electricity every time Dom and Henrietta share a scene and thankfully they share many. And the almost kissing scenes are just as charged as the actually kissing scenes so consider yourselves forewarned. I love discovering new authors and I love a good Regency. I just read a great Regency and now I have a new author to follow. Jessica Nelson managed to capture my interest on the first page and held it throughout the book. She has crafted very believable character that I became invested in early on and the plot was wonderfully done as well. I loved every minute and finished in one day! Now I'm off to find more to read by Jessica Nelson. "Henrietta is stubborn and tenacious. Dominic is swoon worthy yet flawed. He wants to change; she’s resistant to change. They are the perfect hero/heroine combination. Even the secondary characters are endearing, including the headstrong Louise, who is the perfect addition to balance things out. The rapport and dynamics between the characters is enjoyable and realistic" (4 stars @ RT Book Reviews). First off, I love the Regency period! Stories set in this era are automatically my favorite; thanks to Julie Klassen who first introduced me to all things Regency. I think what I like most, is the old-fashioned romance in them. Talk of ladies and lords, fancy balls with high-fashioned gowns & tailored suits gets my heart to melting! Oh and the courting rituals are so quaint and romantic; the lengths a gentleman would go to win the heart of his lady-love. Now, who can resist these types of st First off, I love the Regency period! Stories set in this era are automatically my favorite; thanks to Julie Klassen who first introduced me to all things Regency. I think what I like most, is the old-fashioned romance in them. Talk of ladies and lords, fancy balls with high-fashioned gowns & tailored suits gets my heart to melting! Oh and the courting rituals are so quaint and romantic; the lengths a gentleman would go to win the heart of his lady-love. Now, who can resist these types of stories? Not me! But you came to read my thoughts on this book written by Jessica Nelson. Well, to say I loved it would be an understatement. What I found in the pages of this story was unconventional, unique & unusual topics among other things. A woman who dabbles in apothecary & desires to be a doctor, a gentleman thrust into Lordship & guardianship of his niece who also suffers from a deliberating disease, an uncle & dowager “aunt” who plays matchmaker…these set it apart for me! I love the unusual and unconventional in a book. Not to mention a stubborn, hard-headed, highly independent heroine who doesn’t hesitate to speak her mind, a hero trying to reform himself, and an up and coming young lady who throws convention out the window! Sparking against each other with every encounter and the underlying attraction between them. Makes for a thrilling, entertaining novel of epic proportions, overlaced with faith, of course! Why yes, I would highly recommend it for Regency fans and those, who like me, crave something different in their stories. Ooooo-lah-lah! I loved this book! The Regency era is one of my favorite eras in romance and this book did not disappoint in any way. The heroine, Henrietta Gordon, is a fiesty, no-nonsense, intelligent woman who can hold her own in the midst of disappointment, gender discrimination, and loss. The hero, Lord Dominic St. Raven, is the new heir to an earldom, a handsome flirt who has a secret that could destroy his ability to take care of his beloved ward, his ability to hold on to his title, and u Ooooo-lah-lah! I loved this book! The Regency era is one of my favorite eras in romance and this book did not disappoint in any way. The heroine, Henrietta Gordon, is a fiesty, no-nonsense, intelligent woman who can hold her own in the midst of disappointment, gender discrimination, and loss. The hero, Lord Dominic St. Raven, is the new heir to an earldom, a handsome flirt who has a secret that could destroy his ability to take care of his beloved ward, his ability to hold on to his title, and ultimately his future with the one he has come to love. I loved the growth of Henrietta and Dominic's relationship. From instant dislike, to acceptance, to admiration, to love, these two sparked with electricity when together. Their feelings were so tangible and their chemistry undeniable. And Nelson can write a great kissing scene! My heart is filled with romantic stories, my shelves are loaded with chocolate and my lips are always longing for one more cup of Starbucks. Besides that, I write for Love Inspired Historical and am a happy mom to a bunch of little boys. I love connecting with readers and writers.